We found that Hippocampus mohnikei, the most common seahorse in East Asia, includes three clades with 2.8%–7.3% pairwise differences in their DNA cytochrome b (mtDNA cyt b) sequences, and all the clades are detected in the eastern Korea Strait (only in Geoje), Korea. Clades A and B have different demographic and divergence features via NJ-tree, TCS, mismatch, and BSP analysis from mtDNA cyt b, and the hybridization among the three clades was detected in nuclear DNA (the 1st intron RP1 of ribosomal protein S7 gene, ncDNA S7), implying a possibility of historic secondary contact or ancestral polymorphism. We also found the 1.4%-divergence-per-million-years molecular clock in mtDNA cyt b is appropriate for H. mohnikei through mismatch and BSP analysis comparison. Disconnection of each clade among the Yellow Sea, Korea Strait, and Japanese waters are related to different water masses, therefore there may exist an incomplete biogeographic barriers among them via discordant results between mtDNA and ncDNA. Therefore, a new analysis (such as microsatellite DNA or RAD-seq) must be considered to determine whether H. mohnikei constitutes a widely distributed panmictic population or several reproductively isolated populations. 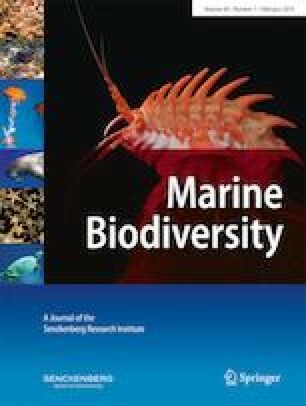 This research was supported by a grant from the Marine Fish Resources Bank of Korea (MFRBK) and by a grant from the National Institute of Fisheries Science, Korea (NIFS, R2017032). We would like to deeply thank M. S. Choi (Southwest Sea Fisheries Research Institute, Korea), J. H. Park (NIFS, Korea), W. G. Park and J. Y. Bae (Zooplanktology lab. of Pukyong National University, Korea), S. Rho, G. E. Noh, and S. O. Shin (Haecheonma, Korea), K. S. Han (Dongwon Institute of Science and Technology, Korea), H. Sugawara, H. D. Mun, G. H. Mun, Y. G. Park, M. S. Kim, and J. H. Lee for help in our sampling.